by Charlie Stewart (@CStewart_ZA) Evidently feeling marginalised by our own set of our clownish MPs, European parliamentarians have just pushed through a set of rules that present an even greater threat to freedom of speech. Around this time last year, I wrote a column detailing the shocking news that South Africa’s parliament had passed the internet censorship bill aka the Film and Publications Amendment Bill. It smacked of the controlling hand of a paranoid big-brother state. Much of what comes out of Brussels is nuts (it’s been a quarter of a century since it passed the bendy banana law) but the EU Copyright Directive represents a new low. The rules include the controversial Article 13, intended to hold tech firms liable for material that’s posted without copyright permission, and Article 11, which states that search engines and news aggregating platforms should pay to use links from news websites. Critics of the early Article 13 draft complained that it would be almost impossible to load content to social media platforms that contained even a tiny part of copyrighted material. That might have been a boon for haters of laughing cat pastiches. Unfortunately/fortunately (take your pick), the law was changed to make provision for memes “for purposes of quotation, criticism, review, caricature and parody”. So, no end in sight for Garfield’s misery. While the intent of the Article 13 is good — artists and creatives should be protected — the worry lies in its enforceability. Facebook’s recent travails around banning white nationalism have shown just how hard it is to screen content and decide what constitutes hate speech vs what is freedom of expression. Quite how it’s expected to build real-time filters that check for copyright infringement is beyond me. Given this, there’s a real fear that, if the EU starts to enforce the law, the social media giants will have no option other than to remove or redact pretty much everything. Which would mean that the very people who were supposed to benefit from this — the creators — would be unintentionally victimised by tech companies adhering to the rules. And it’d likely have a fairly significant effect on an advertising industry that’s often criticised for ‘borrowing’ historic creative. The upside is that ads might become more humorous as agencies play on the parody exemption and serve us more fare like last year’s hit “rolling’ ad from KFC” which made fun of Neymar’s theatrics. While much of the debate has centred around Article 13, Google is worried that Article 11 will turn the internet into a digital ghost town. 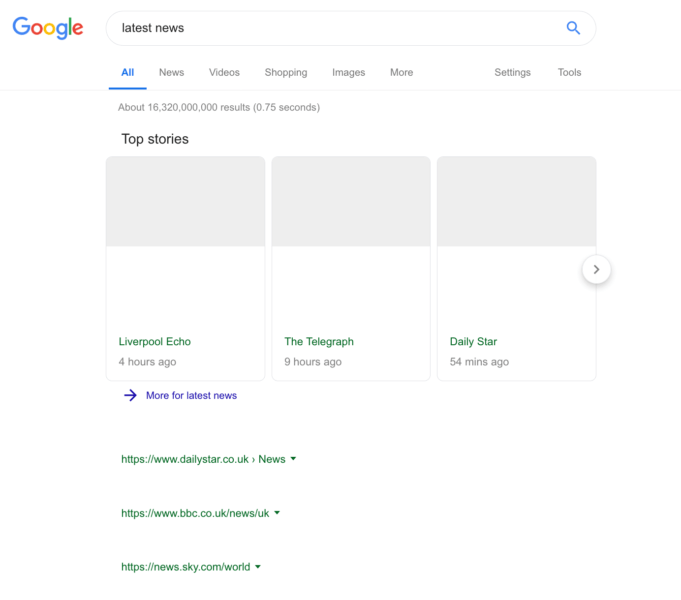 It produced a visualisation of what its search results might look like in an era where it has to pay publishers to show content snippets. Those thinking that there’s no way Google would block publishers from its results should look at what happened in Spain five years ago. In 2014, the Spanish passed its own copyright law with very similar provisions to Article 11. Google’s response was to close down its news feed. The reason it was so quick to close it down was threefold: the search giant had been unable to monetise Google News so it’d rather shutter it than have to pay to keep it alive; it was terrified of further antagonising law makers (and the UK’s very recent announcement that it intends to clamp down on the ‘wild west’ internet just ups the ante to another level altogether); and, most tellingly, wanted to avoid punitive financial penalties for non compliance. The EU hasn’t been shy in hitting Google where it hurts; in the last couple of years, it has levied antitrust penalties of US$9.3bn against it. This suggests we can expect to see more eye-watering fines in the coming months. An internet devoid of hard — as opposed to fake — news is a worrying prospect. But it’s not unthinkable. So, enjoy it while it lasts. Updated at 9.29am on 4 April 2019. Clicks ’n Tricks: Time to ‘fyre’ the influencers?